Day One in the life of three Eastern Bluebirds. Two days later, one of the remaining eggs hatched. By the fourth day, there was still one egg in the nest. And no eggshells. The parents have carried them away. Entice bluebirds to come up close. Offer them live mealworms. 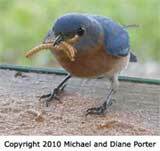 Bluebirds love mealworms. And they especially love to feed mealworms to their babies. You can order mealworms and then keep them in your refrigerator for weeks or months. Offer a few each day to your bluebirds. It's an amazing way to make friends with bluebirds. 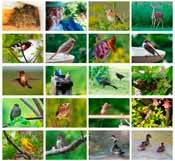 A field guide (bird book) will help you to recognize the birds that share your life. One that we like a lot is the National Geographic Guide to Birds of North America, Fifth Edition. It covers all the birds in North America, and the illustrations are beautiful.